If you want to get an idea of what kinds of great features you can expect in a fantastic RV, you can get your start by renting! 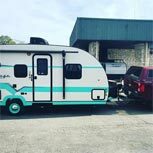 We carry many fantastic RV rentals that will give you a taste of how sweet the RVing life can be. Check out our rental fleet below and make sure that you contact us today with any questions that you may have.